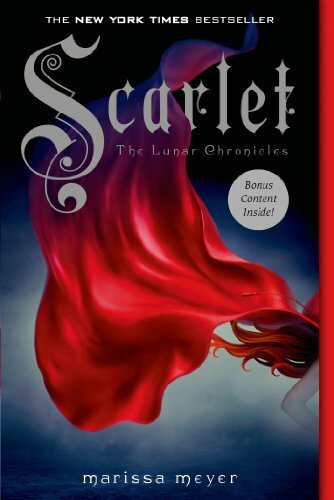 Scarlet is the second installment in Marissa Meyer's young adult, science fiction series The Lunar Chronicles (click here to read my review of the first book, Cinder). Unlike Cinder which took place in New Beijing, Scarlet is set in Rieux, France, likely the author's nod to French origination of the "Red Riding Hood" fairy tale by author Charles Perrault. Scarlet Benoit lives with her grandmother on their farm. Upon her grandmother's disappearance, Scarlet sets out to find her grandmother and the truth regarding her grandmother's past as a European Air Force pilot. On her search, Scarlet meets Ze'ev "Wolf" Kesley, a street fighter who saves her from a violent confrontation after she voices her support for the infamous cyborg, Cinder, who is in fact the missing Lunar Princess Selene on the run while trying to overthrow the evil Queen Levana. Upon returning to her farm, Scarlet encounters her father whom she hasn't seen for years but who warns her about her new friendship with Wolf, a man she knows little about. When Scarlet confronts Wolf and asks him if he knows her grandmother's whereabouts, he reveals that her grandmother was kidnapped and yes, he is used to be one of the kidnapper's gang. Scarlet has to find her grandmother, decide whether or not she can trust Wolf to help her, and figure out how her family's secretive past plays a roll in the burgeoning political rebellion. Meanwhile, the fugitive Linh Cinder has escaped from prison and deceived a fellow fugitive and pilot, Carswell Thorne, into helping her steal a space ship and fight Queen Levana, queen of Luna, who is plotting to marry her new prisoner, Prince Kai, and thus extend her reign over the entire Earthen Union planet. As I mentioned in my review of Cinder, I actually read Scarlet first. Despite not knowing the full background of Cinder's role in the Luna versus Earthen battle, it was easy enough to catch onto considering Meyer's use of the fairy tale tradition. While I found Scarlet and Wolf's attraction to each other eye-roll worthy, I was intrigued by the premise and wanted to learn more about the series. I really like seeing YA novels with physically and intellectually strong female heroines, but could have done without emphasis on beauty and scenes of stereotypical fairy-tale romance. I was particularly intrigued by Scarlet's grandmother and her military past, a more complicated and empowering rendering of the character that I'd ever encountered in retellings of "Red Riding Hood." Have you read Cinder or Scarlet? What did you think about Scarlet and Wolf's relationship? Were you surprised by the ending or her grandmother's past?